Continuing with the trend of reaching beyond our national borders, webmekanics has yet again successfully completed a Web Design project for an offshore company. IMPACT MCR is a Manchester based Mortgage, Property Letting, Sales, and Maintenance services provider with a good clientele’ in the United Kingdom. Webmekanics, being a professional Web Design Company presented the client with a number of website designs to choose from and the current design of the website is one of the options presented, of course with minor tweaking. 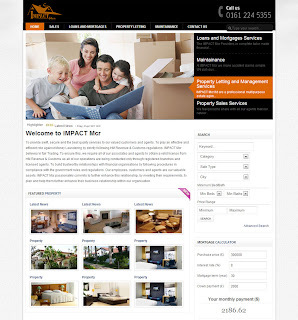 IMPACT MCR current website offers full fledge listing of property for letting, or sale purposes along with the options of attaching pictures gallery and videos. The visitors to the site can search the whole database against a number of selections to get what they are looking for. Webmekanics feels proud to work with IMPACT and wishes best of luck in their business.